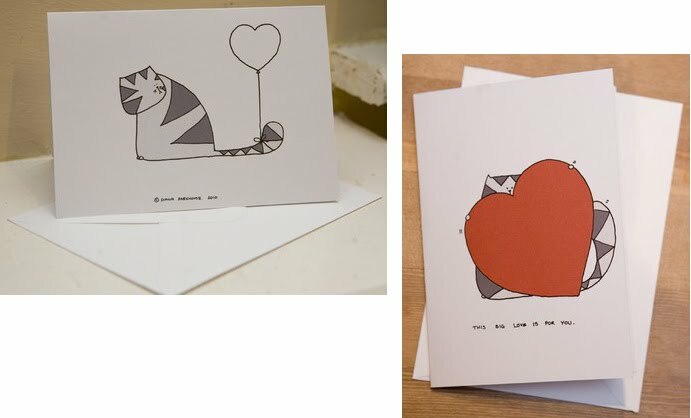 Valentine's Day is just around the corner, and it's time to start thinking about cards! I usually go old school and craft my own valentines, but the selection I came across this year might force me to change my mind! Photographer Kate Funk loves to dress up her handsome black kitty, AC, and put him in a variety of humorous situations to create greeting cards. This love-themed card is the cat's meow, and comes with a red envelope and wrapped in cellophane. Dear readers, your love for cat feet is legendary, so as soon as I saw this card I knew it had to be on my list! It comes with a white envelope, and is signed by the artist on the back. 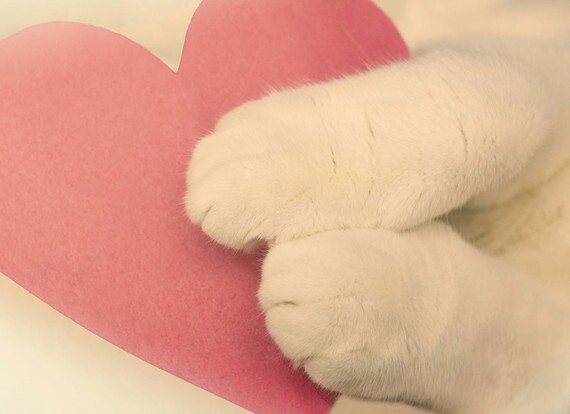 As an added bonus, $1.00 from each card sold will be donated to the Furever Home Adoption Center in East Petersburg, PA to help benefit homeless animals! This particular design is also available as a print, and the shop stocks some other gorgeous cat pieces too, which you can see here. 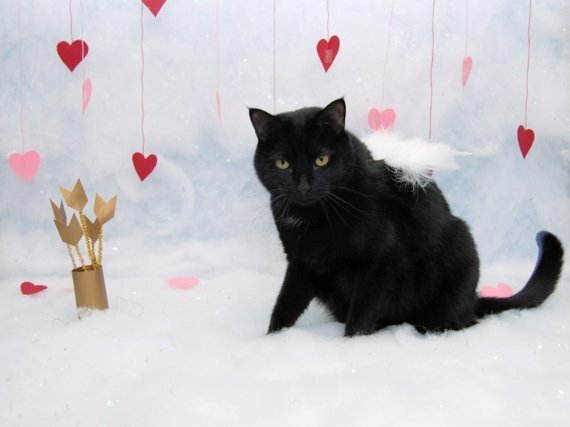 We profiled Renee and her "ugly kitty" Quasi back in November, and the fantastic duo are back just in time for Valentine's Day! 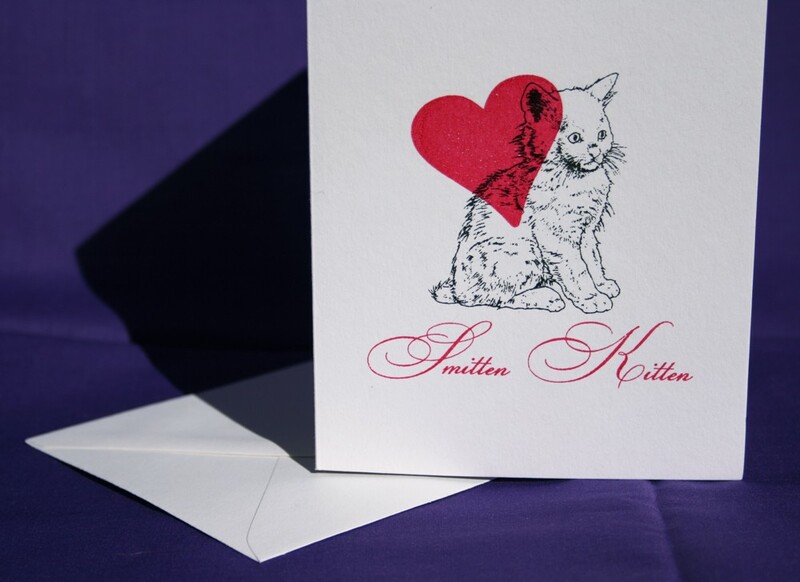 Show the one you love how "smitten" you really are with this lovely screen-printed creation! 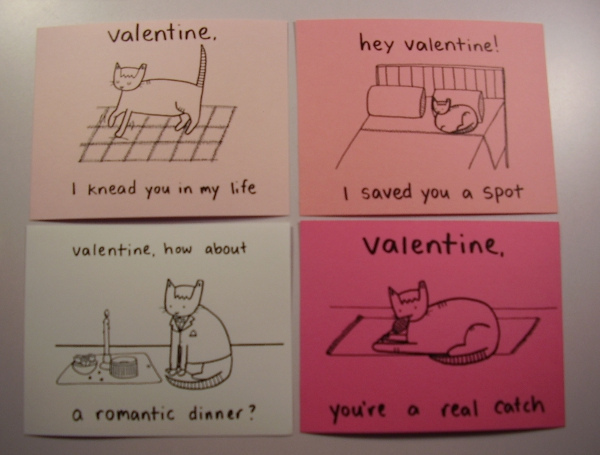 Our friend, comic book writer/illustrator Hey Pais, has been creating her own set of valentines for the past few years. The 2011 version comes on pretty pink paper and is available in two styles - Hey Pais Jokes (pictured) and Star Trek: The Next Generation. In addition, Pais has also created these sweet custom envelopes to match! 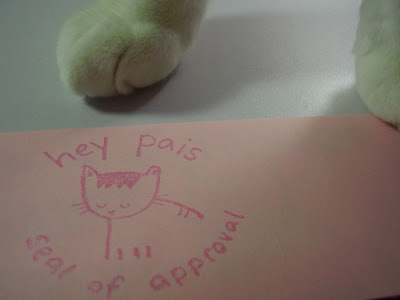 The pink envelopes come stamped with the "Hey Pais Seal of Approval" in pink shimmery ink, and four red heart stickers! UK-based artist Diana Parkhouse is the creator of SAD FACE, that she describes as, "a mixed media tabby cat illustration exploring the more difficult aspects of life such as unhappiness, depression and the absence of cake." Her website is updated every Monday, Wednesday, and Friday and I highly recommend you check it out! 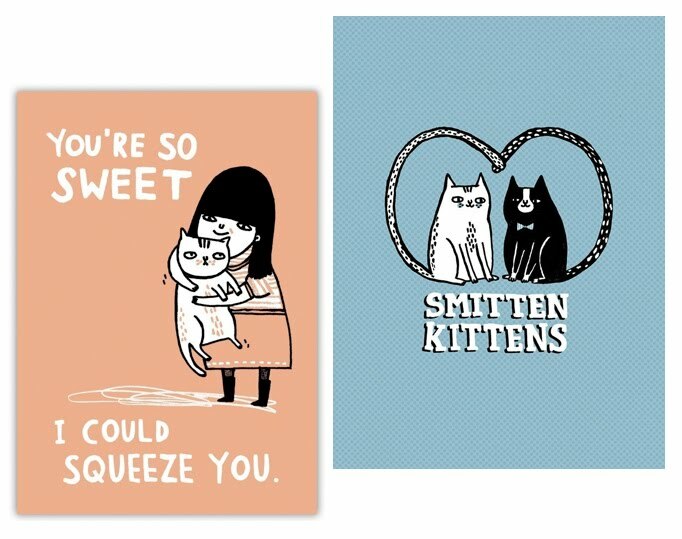 In the meantime, get your SAD FACE fix with these valentines, which are also available as prints. 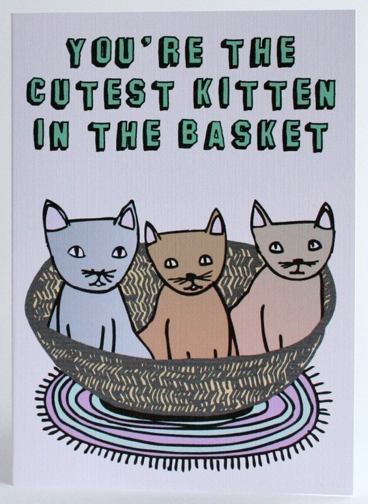 Gemma Correll creates adorable images often containing cats and/or Pugs. These cards are just a small selection of the items she has in her amazing Etsy shop, that carries everything from wrapping paper and tote bags, to T-shirts and buttons, all containing her clever designs. Able and Game's valentines aim to be "eccentric, yet truthful and romantic, instead of the usual cards that feature bunches of roses and boxes of chocolates." 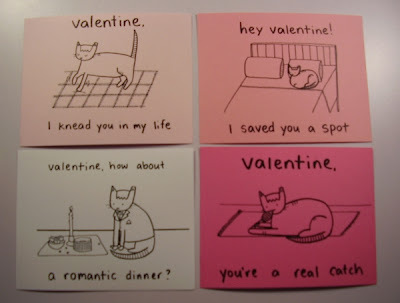 They certainly succeeded with this selection, that will tickle your valentine with the sweetest compliment of all! Looking for something a little different? 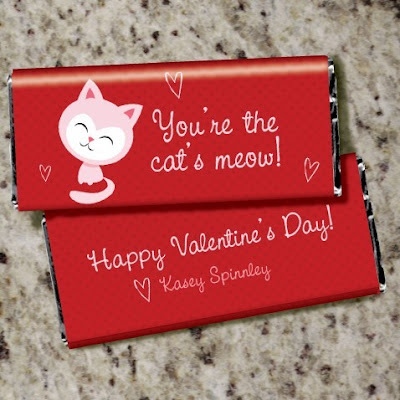 I'm a chocolate addict, and would purr with delight upon receiving one of these customized cat candy bar wrappers! For $12.00, you get 20 customized wrappers, your choice of silver or gold foils, and illustrated wrapping instructions. They fit regular sized Hershey bars, which you must purchase on your own, or if you prefer, the seller offers pre-wrapped bars starting at $1.25 each. Finally, why not get a special treat for your friend AND their cat? 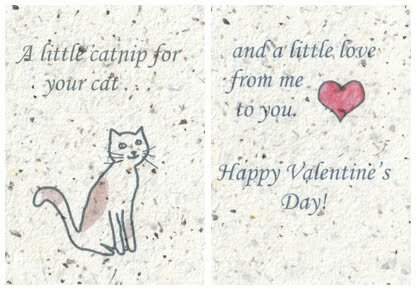 Catnip Cards creates greetings cards printed on handmade paper made out of cotton, catnip, and edible ink! Once you read it, just hand it over to kitty and the fun really begins! As their tagline says, "They may not read it, but they'll love the content!" Catnip Cards designs greetings for other occasions as well, such birthdays and the arrival of a new pet, and they claim all their scrap paper goes to shelter cats. great array of cards! love them! I really like SAD! Thank you for featuring one of my cards!